May 29, 2018 at 8:36 am. Ferrell, after his productive redshirt sophomore season last year, was an expected first-round pick in the 2018 NFL Draft. However, he (along with defensive line teammates Austin Bryant and Christian Wilkins) stunned many by deciding to return to Clemson, setting up even higher expectations for 2018. Ferrell finished second in the ACC in tackles for loss (18.5) and sacks (9.5) last season, falling just behind Bradley Chubb (drafted fifth overall in 2018) in both categories. 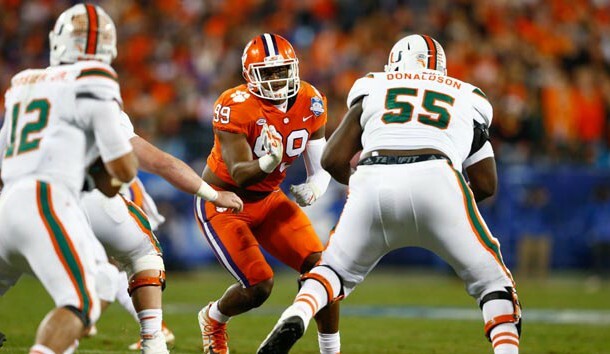 While those numbers will be tough to eclipse, Clemson returns all four starters on the defensive line, which will keep opponents from routinely doubling Ferrell or scheming help to his side of the field. Although Ferrell’s game doesn’t have glaring holes, NFL scouts are hoping to see improved consistency as a run defender and, with his get-off, cutting down on the offsides penalties. Despite his flashy statistics, he left some production on the field last year and needs to be a better finisher in the backfield. Quiet by nature, Ferrell became an “incredible” leader, according to the coaching staff, and his continued maturation in that regard will boost his NFL profile. Although not overwhelming in either category, Ferrell has an efficient mix of power and quickness. He uses his edge speed, play strength and active hands to forklift blockers or set up rush moves to elude jabs and stay free. Ferrell uses his length and forward lean to gain leverage at the top of his rush, flashing a strong rip move once he gains the advantage. Similar to Chubb, Ferrell isn’t an elite change-of-direction athlete, but his first-step quickness and ability to time up the snap keeps offensive tackles awake at night. He might jump early at times, but his discipline improved throughout the season, trusting his eyes and not fallings for fakes, which also showed vs. the run when playing contain. Effort was not a question mark on the game tapes studied, which especially showed vs. Louisville on a play in which he chased down speedy quarterback Lamar Jackson and made the tackle. Overall, Ferrell has been on an ascending trajectory since he arrived at Clemson. He went from 12.5 tackles for loss and six sacks in 2016 to 18.5 tackles for loss and 9.5 sacks last season. Regardless if his production sees a significant boost or not, Ferrell’s consistency and polish have room for improvement, which could make him the 2019 NFL Draft’s version of Bradley Chubb. Ferrell, who also played high school basketball, was an all-state performer as a junior defensive end at Benedictine College Prep in Richmond, Va., with 60 tackles, including 26 tackles for loss and 11.5 sacks in 2013. While some of the recruiting buzz quieted after he missed his senior year with an ACL injury, Clemson stayed committed to Ferrell (and vice-versa).